Q-upNAVI is designed with the Process Engineer in mind, providing High Level Statistical Analysis supported by High Quality Color Imagery of your Process. Data is collected from any of Omron’s SPI, AOI and AXI Systems that’s presented in a format for Easy Process Diagnosis for Engineers and Operators. 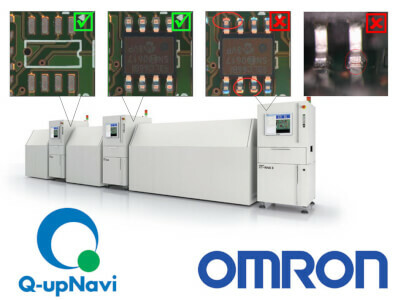 Omron’s Q-upNAVI is an Exciting Innovation, High Level Process Improvement Tool. Navigates Engineers and Operators in locating all Process Defects. Quick Result Feedback of Manufacturing Process Changes. Quality Analysis of Process Defects, supported by High Quality Color Images. Stabilise your Process providing Achievable Process Target’s to 99% FPY. Real Time SMT Process Monitoring, with coverage of all Production Lines. Reduction in AOI Optimisation and Verification.